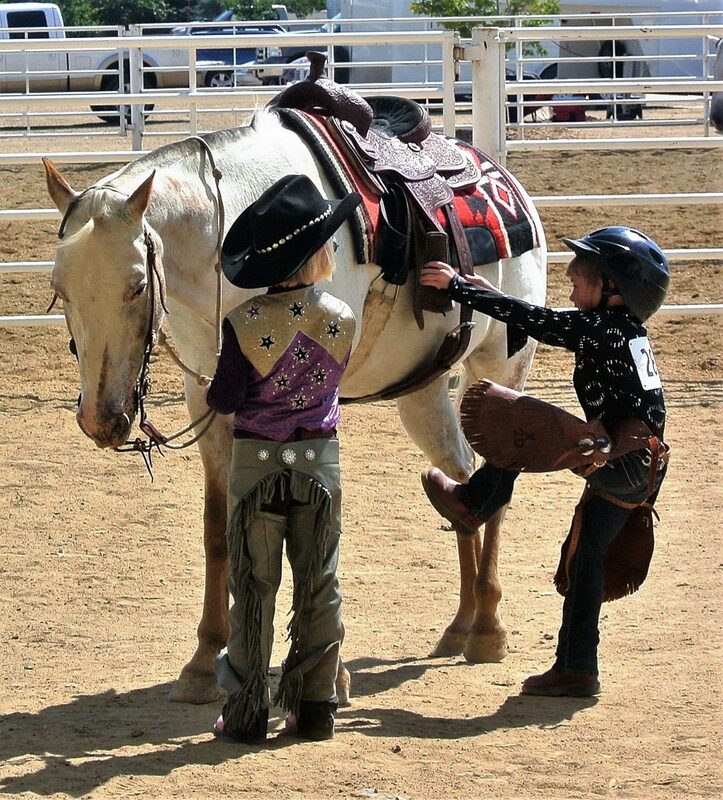 Three-way teamwork at this Colorado POA show demonstrates the patience and kind disposition of this pony. Some bonds can’t be broken, not by time, circumstances or cultural changes. Two northern Colorado horsewomen are examples of that fierce kind of loyalty. They have been involved with the Pony of Americas breed for decades and see no end of that happy trail in sight. Barbara Klein of Wellington and Janette Arends of Hudson are longtime members of the Colorado Pony Of the Americas Club (COPOAC). Both are national inspectors and Arends is also the Colorado treasurer and Rocky Mountain National director. Those titles represent important responsibilities and ongoing dedication to the breed. Founded in the 1950s, the POA was initially the product of an Appaloosa mare crossed with a Shetland stallion. The first offspring, called Black Hand 1, is the breed’s foundation sire. Since then, out-crosses to Quarter Horses, Arabians and Welsh ponies, with further infusions of Appaloosas and Shetlands, developed the modern POA. The best features of all those crosses produced a popular, versatile animal for children and, especially in-harness, for adults as well. This all-around family pony has a good mind and superb temperament. The breeding intent is for each foal to have an Appaloosa-type color pattern. For registration purposes, adult individuals must stand between 11.2 and 14 hands high. Klein began her life in urban Los Angeles but managed to ride at a nearby stable. In college at Colorado State University in Fort Collins, she majored in agriculture, which at the time covered horses, sheep, cows and pigs. There was no specific equine major. After graduation, she married Ray Klein, a Crook, Colo., World War II veteran from a German-Russian family that had worked in sugar beets. The couple had three children and settled in the Wellington/Fort Collins area. Ray bought Barbara her first horse, a Quarter Horse mare called Lady, that she boarded at a friend’s farm. Then the Kleins added some Shetlands acquired from a Loveland man. Once Barbara’s eyes “spotted” POAs, it was love at first sight. She tried to purchase a stud, first responding to a newspaper ad, a big disappointment as the little stallion turned out to not be a POA. In 1968, Klein attended a POA Sale in Mason City, Iowa, and finally bought her breeding stallion, Corrette’s Comanche, who was the Reserve Grand Champion at the POA International Show. Now Comanche needed a broodmare band, which came from a dispersal sale in Montana. Klein’s plan was coming to fruition as foals for show and sale began hitting the ground the following year. Klein’s three kids were happy about it all too, especially the two girls, Andrea and Pam, who rode through high school. Youngest daughter Pam still works with and shows the ponies. The two girls rode English, Western, and Trail (no gaming). Her small stature (5’2”) allowed Klein to also ride the larger ponies and she showed foals in halter. Although Klein’s show ponies could likely have successfully competed at the national level, she originally limited travel to Colorado events. Ray farmed a couple thousand acres of alfalfa, corn, oats and brew barley for Coors. It was just too difficult to get away for distant competitions. Just when everything was running smoothly, tragedy seemed to end it all when Ray was killed in an auto accident. Klein sold her large acreage and all the ponies. She used some of the profits to travel internationally for a few years with Friendship Force, a worldwide club that advances knowledge of other cultures by staying in members’ homes. Twenty years after Ray’s death, one of Klein’s POAs was inducted into the POA Hall of Fame. The gelding, Klein’s Flashy Eagle, had changed hands many times over the years. The all-around pony taught many tiny tots to ride, thereby promoting the breed’s versatility. Klein accepted the invitation to attend Eagle’s award ceremony, where she again began rubbing elbows with POA club members. “I wanted back in,” she bluntly declared. In 2004, she did so by buying a POA mare, Bodacious Bambi. Klein had actually raised Bambi’s sire, a Supreme Champion. Over the years that followed, she added more animals to her herd. Klein, now age 80, currently owns two broodmares (both of whom produced 2018 foals); a small Appaloosa stallion; and a 2017 gelded colt that Pam shows in halter, lunge line for ages 2 and under, and in-hand Trail class. Janette Arends’ history with the POA breed also goes back decades. Her (now grown) son and daughter grew up in 4-H and with POAs. As a Colorado club member, she had many humorous and exciting memories to share. Years ago, a group of club members travelled together to Oklahoma for an international show. It’s common for them to do so in case there’s some kind of emergency along the trip. It’s also more fun for everybody’s kids that way. The weather that day was just right for a refreshing rest stop. Ice cream sounded good, which required maneuvering a drive-thru, with at least one large motor-home pulling a two-horse trailer. Everyone held their breaths. All were happily surprised that they made it. On another road trip, Arends and her daughter were a few miles outside Tulsa, Okla. Things were going well until they stopped at a friend’s place to stable the horses along the route to the show. First, Arends pulled the bumper off on a fence post. No problem, the show must go on. Once in Tulsa, she promptly became lost. No problem. Eventually finding her bearings, she made it to the fairgrounds where everything seemed back on track. Until, that is, when her daughter decided to wash her hair. Arends went into the trailer for something at that point, becoming hopelessly locked in when the wind slammed the spring-loaded door shut; no way to reach the latch from inside. She yelled for help but her coif-cleaning offspring was in the camper with a sudsy head of hair, blissfully unaware of her mother’s embarrassing plight just a few feet behind her. Arends finally swallowed her pride and shouted at a passing stranger for help. COPOAC is a very family-oriented group that includes competitions for all ages. There’s lead-line for children age 6 and younger; riding classes for 9 and under; ages 10-13; ages 14-18; 19 and over. One particularly entertaining and photo-worthy class is leadline costume for itty-bitty youngsters riding itty-bitty ponies. The more creative the attire for both, the better. Potlucks, cookouts and other events are held throughout the season. Arends now owns two mature stallions, two broodmares and two foals. Her breeding stallion is Doc’s Toughest Yet, a 21-year-old few-spot leopard. In their role as national inspectors, Arends and Klein check ponies at shows to be sure animals under age 6 meet height and color guidelines. Once fully grown (at 6), they are again inspected before receiving their permanent height card. They must be under 14 hands high (56 inches). Arends and Klein truly love and eagerly promote the pony breed that is “easy to spot”. Its versatility, eye-pleasing color and conformation, and good disposition are unbeatable. COPOAC currently has 32 member families. Besides nine Colorado shows, its POAs can compete at the Rocky Mountain Regional and the West World Show. An annual membership fee is $35 per family. Further inquiries are welcome and information can be obtained at http://www.copoac.org, or by phone to Janette Arends at (303) 536-4476.